A prototype of the SR-10 aircraft made its first flight in December 2015. Image courtesy of Pavel Adzhigildaev. The SR-10 seats up to two crew members in tandem configuration. Image courtesy of Pavel Adzhigildaev. The SR-10 is powered by a single engine, mounted at the rear. Image courtesy of Pavel Adzhigildaev. The SR-10 features tri-cycle landing gear. Image courtesy of Pavel Adzhigildaev. A prototype of the SR-10 single-engine light aerobatic jet trainer aircraft made its first test flight in December 2015. The trainer airplane is designed by Modern Aviation Technologies (KB SAT) design bureau to meet the pilot training requirements of the Russian Air Force and private aircraft operators. The aircraft is intended to provide elementary and intermediate flight training for future military fighter aircraft pilots, athletes and amateur pilots. Tests on the light trainer plane are currently underway at the Gromov Flight Research Center in Moscow and the mass production is expected to start in 2017. Development of the aircraft began in 2007. A mock-up of the aircraft was demonstrated at the MAKS-2009 International Aviation and Space Show held in Zhukovsky, Russia, in August 2009. The aircraft was officially rolled out in August 2015. During the maiden flight, KB SAT assessed the stability, controllability, flight characteristics, and operation of onboard systems and equipment. 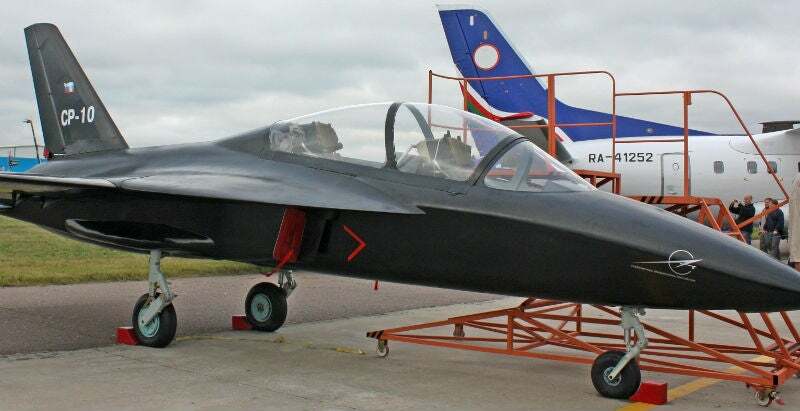 The Russian Ministry of Defence is expected allocate up to RUR2.5bn (approximately $34m) for the SR-10 jet trainer development project. A total of 16 units are planned to be procured for the Russian Air Force. It has an overall length of 9.59m and a wing span of 8.40m. The main wings, fitted to the middle section of the fuselage, are swept forward at an angle of 10°. The flight control surfaces such as ailerons and flaps, which are attached to the trailing edges of the wings, help provide safe flight. The tail assembly has one vertical stabiliser and twin horizontal stabilisers. A rudder hinged to the vertical stabiliser allows stable flight. The aircraft is fitted with a retractable tri-cycle landing gear comprising a single wheel attached to the nose and two main wheels underneath the fuselage. The flight training and aerobatic aircraft is built with a double cabin, providing comfortable working conditions. It accommodates two crew members, pilot and instructor, with dual controls in tandem configuration. The pilots have an unobstructed view through a large canopy. "The aircraft is intended to provide elementary and intermediate flight training for future military fighter aircraft pilots, athletes and amateur pilots." The ejection seats of Class 0-0 provide safety to the crew in emergency, while the built-in flight control system is user-friendly. A rear-mounted AI-25TL turbofan engine, manufactured by Ivchenko Progress, powers the prototype of the SR-10 trainer airplane. The production aircraft will be powered by a 1.95m-long AL-55 turbofan engine developed by NPO Saturn. The AI-25TL has a thrust of 3,792lb, while the AL-55 generates a take-off thrust of 3,880lb. The take-off and landing airspeeds of the jet trainer are 190km/h and 185km/h respectively and the rate of climb is 60m/s. The aircraft has a maximum manoeuvrable speed of 700km/h, maximum airspeed of 900km/h, cruise speed of 520km/h, and maximum bank rotational speed of 7r/s. It can reach up to an altitude of 6km and fly up to a range of 1,500km. The maximum take-off and landing weights of the trainer aircraft are 2,700kg and 2,000kg respectively. The aircraft is capable of performing manoeuvres with G-limits of +8G to -6G.